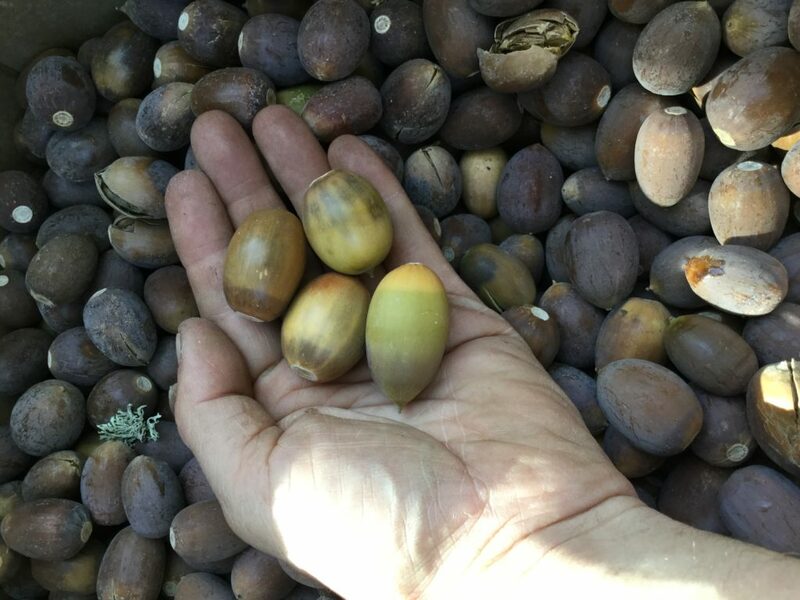 Harvesting – Acorn Nutrition Is The Future! *Please remember to leave plenty of acorns for wildlife to eat. Countless birds, insects, and mammals rely on acorns for their food supply, including some species storing acorns for their crucial winter food supplies. This is especially important if you are harvesting acorns in urban areas, where food for wildlife is very limited. 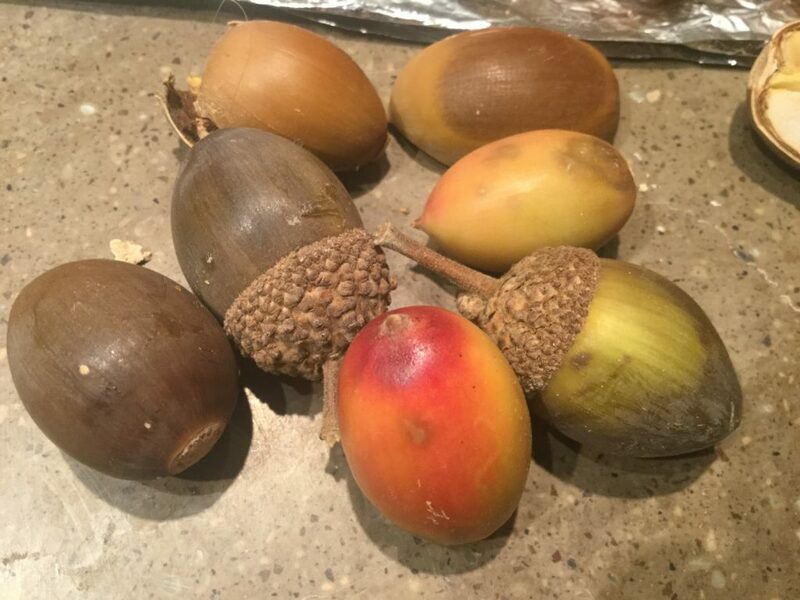 These are perfect acorns: large, fresh, and insect-free. 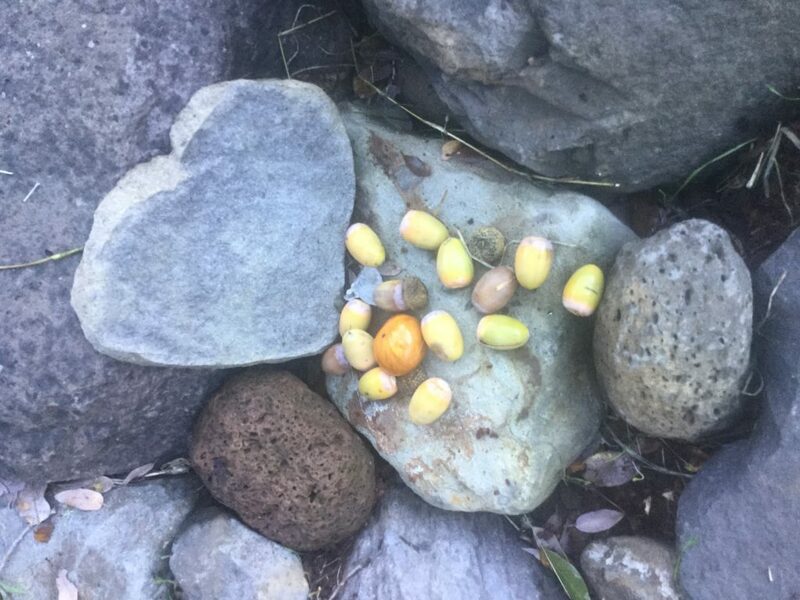 Acorns are freshest when green, and turn yellow then brown as they age after falling from the tree. -Collect only the finest and largest acorns in the best condition. That means do not pick up every acorn you see, and do not keep every acorn you pick up. Reject the acorn nuts that have been invaded by an insect or worm. This includes whole nuts that have a small “exit hole,” where an insect bored out, after eating (and pooping) inside the acorn shell. Green acorns have fallen recently, so are less likely to be hosting ground-entry insects. -Collect in areas with less brush and tall grasses, etc. Acorns are much more visible in places with fewer plants under the oak trees, even including some parking lots, disturbed areas, gravel areas, and roadways. Collecting the acorns can be the easiest part of the harvest. The more you collect, the more work you have cut out for yourself to do the processing! 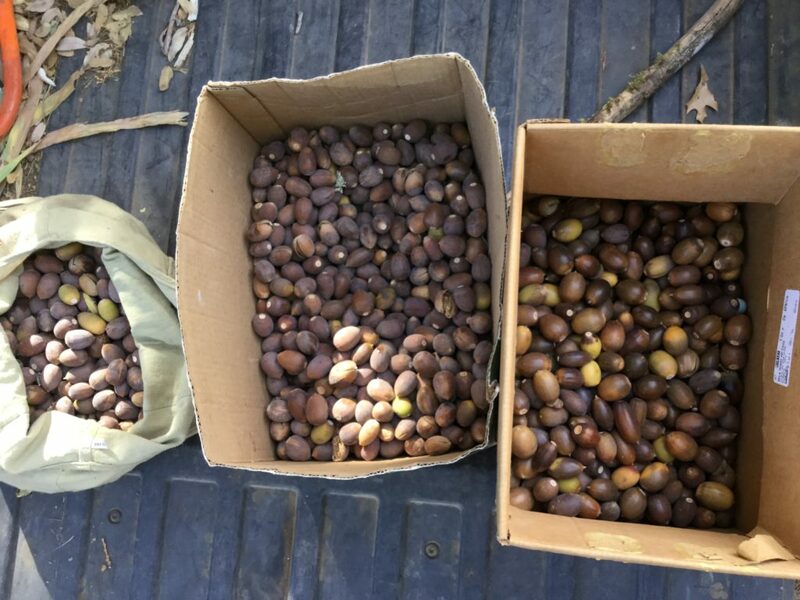 -If you are collecting in an area with plentiful acorns, cull your harvest by throwing back acorns that are visibly invaded, shell compromised, have insect holes, mold, etc. *Please avoid over-harvesting in your area: Remember to leave plenty of acorns to nourish the plants, animals and fungi of the Oak habitat! -Be careful to spread out your acorns to dry after harvesting! (Applying heat is helpful too) If you simply leave your acorns in a box or bucket, they will likely start hosting mold colonies, as the nuts release lots of moisture every day.